A woman leaves her husband for another man and justifies her decision, saying, “I just wasn’t happy in my marriage anymore and I don’t think God wants me to be miserable. I think He understands. I think He wants me to be happy.” Excuses like this can be heard all the time for all manner of decisions people make. 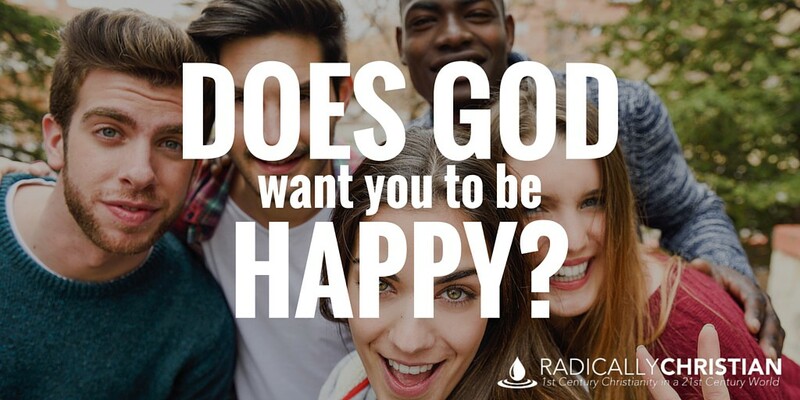 So the question deserves consideration, does God want you to be happy? Here are some thoughts on that question. This is the kind of happiness that goes far beyond the shallow and superficial happiness, which is simply the result of fleeting circumstances. The happiness God wants for you can be yours even in the midst of life’s worst pains and sorrows. God knows the ONLY chance you have at this kind of happiness is to be in fellowship with Him. The world thinks happiness, joy, and blessedness come from having a satisfying sexual relationship, a lucrative career, a college education, a healthy body, being a parent, or any number of earthly things. They chase these things, thinking they will bring happiness. Ultimately, like Solomon, if people live long enough they find that each of these earthly pursuits is a “chasing after the wind” (Ecclesiastes 1:14). Things fail. People die. People disappoint us. In the end, the only thing that truly satisfies, the only thing that truly fulfills, the only thing that lasts forever is fellowship with God (see Ecclesiastes 12:13-14). “Though the fig tree should not blossom, nor fruit be on the vines, the produce of the olive fail and the fields yield no food, the flock be cut off from the fold and there be no herd in the stalls, yet I will rejoice in the Lord; I will take joy in the God of my salvation. God, the Lord, is my strength; he makes my feet like the deer’s; he makes me tread on my high places” (Habakkuk 3:17-19). And of course, there is only one alternative to having fellowship with God and that is separation from God, which is a miserable and hopeless condition. Most people are familiar with Jesus’ “beatitudes” at the beginning of the Sermon on the Mount (Matthew 5:3-11), yet we often fail to apply them to this particular discussion. Jesus helps us to see that being in a “blessed” state is not a matter of riches or relationship status. Do you see? This is blessedness. This is happiness. This is joy. Being a child of God, being a part of His kingdom, being in fellowship with Him is what true happiness looks like. Everything else is just temporary. How Can You Have Fellowship with God? “That which we have seen and heard we proclaim also to you, so that you too may have fellowship with us; and indeed our fellowship is with the Father and with his Son Jesus Christ. And we are writing these things so that our joy may be complete” (1 John 1:3-4). But he reminds his audience that if they walk in sin, they cannot have fellowship with God because He is a holy God (1 John 1:5-6). The only way to have fellowship with God, with His Son, and with one another is to “walk in the light,” being cleansed by the blood of Christ (1 John 1:7). Ironically, when we use our own “happiness” as an excuse to sin, we’re actually throwing away the only chance we have at true happiness. We are exchanging the happiness and joy of fellowship with God for the “fleeting pleasures of sin” (Hebrews 11:25). What a horribly miserable exchange! Do I Have to Be Perfect? Of course you don’t have to be perfect in order to enjoy fellowship with God. But you do have to confess your sins and forsake them. You have to live a repentant life. You have to give up the darkness and walk in the light. You have to stop justifying, and making excuses for your sins (see 1 John 1-2). “…we all once lived in the passions of our flesh, carrying out the desires of the body and the mind, and were by nature children of wrath, like the rest of mankind. But God, being rich in mercy, because of the great love with which he loved us, even when we were dead in our trespasses, made us alive together with Christ—by grace you have been saved—and raised us up with him and seated us with him in the heavenly places in Christ Jesus, so that in the coming ages he might show the immeasurable riches of his grace in kindness toward us in Christ Jesus” (Ephesians 2:3-7). This is where the rubber meets the road. This is where we separate the carnal-minded from the spiritually-minded. Is your end your destruction? Is your god your belly? Is your glory in your shame? Is your mind set on earthly things? Or do you desire fellowship with God? Are you willing to forsake temporary pleasure? Are you willing to walk by faith and not by sight? Are you willing to offer your body as a living sacrifice to God? It is only then that you will experience true happiness, joy, satisfaction, and blessedness. The choice is yours, but YES God does want you to be happy. He wants you to have the only thing that brings true happiness: eternal fellowship with Him (1 Timothy 2:4; 2 Peter 3:9).